According to oral tradition, a man who was collecting shellfish was surprised by the in-rushing tide; to save himself he cried out, “I wish I might turn into a sea otter!” His wish was granted, which is why, it is said, the internal organs of a man and a sea otter look the same. 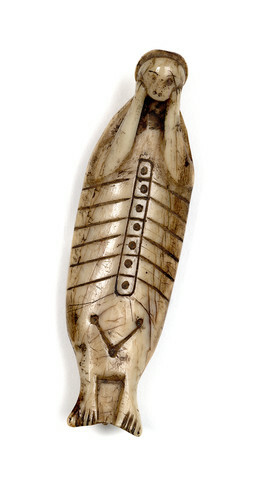 This ivory hunting charm was fastened inside the cockpit of a kayak. The otter’s ribs and spine are shown, perhaps because an otter’s soul was believed to reside in its skeleton. Its bones were returned to the sea so a new otter could be born. Laurie Mulcahy: Did the old timers use any good luck type charms though? [Did you] hear any old stories like that? Larry Matfay: I hear old stories. They had good luck charms. I don’t believe too much. I found in the attic of house down in Old Harbor a little box, it’s this long [ about four inches]. There was a little sea otter in there. A baby sea otter. And the guy told me, “That’s for our good luck. We put that up on the kayak and pretty soon we find a sea otter.” I don’t know if that is true or not. Laurie Mulcahy: What was it made out of, bone or wood? Larry Matfay: No, it’s a little sea otter. It’s all dried up. Laurie Mulcahy: Oh, like an embryo. Larry Matfay: Yes. And they kept it in a little box for good luck. Take it around with them hunting. Laurie Mulcahy: They would do that with little bears also? Larry Matfay: I don’t know. I don’t think so. I hear some funny stories a little bit. Some I believe, some I think about a little more. Maybe they are true. It makes sense sometimes, when you think about them.